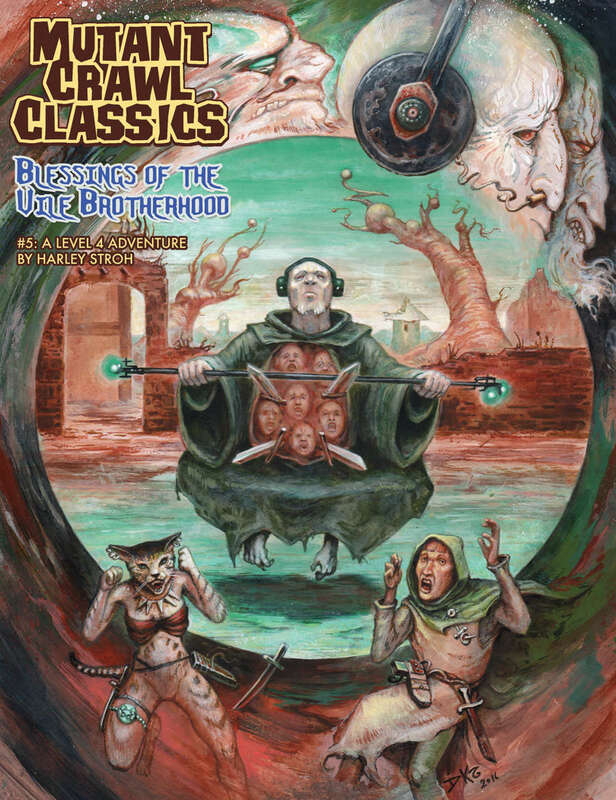 Mutant Crawl Classics #5: Blessings of the Vile Brotherhood is the fifth release for Mutant Crawl Classics Roleplaying Game – Triumph & Technology Won by Mutants & Magic, the spiritual successor to Gamma World published by Goodman Games. It is the fourth adventure to be designed for use with player characters who are not Zero Level, being instead designed for player characters of Fourth Level. What this means is that it is not a Character Funnel, one of the features of both the Mutant Crawl Classics Roleplaying Game and the Dungeon Crawl Classics Role Playing Game it is mechanically based upon–in which initially, a player is expected to roll up three or four Level Zero characters and have them play through a generally nasty, deadly adventure, which surviving will prove a challenge. Those that do survive receive enough Experience Points to advance to First Level and gain all of the advantages of their Class. In terms of the setting, known as Terra A.D., or ‘Terra After Disaster’, this is a ‘Rite of Passage’ and in Mutants, Manimals, and Plantients, the stress of it will trigger ‘Metagenesis’, their DNA expressing itself and their mutations blossoming forth. Rather Blessings of the Vile Brotherhood is designed for characters of Fourth Level, so each of the player characters will have a range of powers and abilities as equipment and artefacts scavenged after two or three adventures out in Terra A.D.
Mutant Crawl Classics #5: Blessings of the Vile Brotherhood is designed to be played by between six and eight player characters of Fourth Level. Like the previous Mutant Crawl Classics #4: Warlords of ATOZ, the set-up and the structure to Mutant Crawl Classics #5: Blessings of the Vile Brotherhood is also very different to previous scenarios for Mutant Crawl Classics, being more of a traditional roleplaying adventure. In the other adventures for Mutant Crawl Classics, the adventures have strong exploratory elements to their play, the player characters searching for artefacts of the Ancients as well as overcoming whatever challenges the scenario entails. In Blessings of the Vile Brotherhood, the player characters and the tribe they belong to, the Tribe of the Cog, are faced with a terrible problem–the tribe’s prized possession, a functioning medibot, has broken down and it far beyond the capability of anyone in the tribe to repair the important robot. As important Seekers–those of the tribe who have passed their rites of initiation and thus have proved themselves capable of finding artefacts of the Ancients, protecting the tribe, and undertaking missions to further its betterment–the player characters are tasked with taking the dead bot on the long path of the Pilgrim’s Way of the Holy Medicinal Order in order that the holy monks can repair it. Mutant Crawl Classics #5: Blessings of the Vile Brotherhood is thus a quest and a trek in classic fantasy fashion. It is primarily a wilderness adventure, almost a hexcrawl, but one with just a handful of locations and unlike other hexcrawls, like the recent What Ho, Frog Demons! – Further Adventures in Greater Marlinko Canton and Fever Swamp, all of those locations are strung out on one route, the Pilgrim’s Way. There are no other locations in the scenario, that is, none in the extensive mountain wilderness which lies to either side of the path. Now there is a good reason for this. In previous scenarios for Mutant Crawl Classics, the threat has been primarily static, the player characters coming to it rather it coming to them. In Blessings of the Vile Brotherhood, its central threat is not only coming to them, it is hunting them. In a nod to Walter M. Miller Jr.’s A Canticle for Leibowitz, a relic of the Ancients has been released and in this scenario will be attempting to continue its programming–destroying all threats. It is an incredibly dangerous foe, even for characters of Fourth Level, but there are multiple ways in which it can be thwarted and hindered, so that clever players can reduce the danger it represents. Nevertheless, the foe is still a major danger and it is still an intelligent danger, because once it locates the player characters, it will constantly hunt for them, but that sets up a problem with the scenario. The easiest route from the start of the scenario at the beginning of the Pilgrim’s Way to the characters’ final destination at The Lost Monastery is along the path as it winds through the mountains, but being on the path makes it easier for the threat at the heart of the scenario to locate the player characters. Given how tough an opponent this threat is, it is likely that the player characters will go off piste and head across land to their destination, as this will make it harder for them to be tracked or spotted. Yet that avoids all but the final pre-written encounter in the scenario and places much more of the emphasis in the scenario on random encounters. Now some of these are good and some of them are quite fun for the Judge to roleplay, but this just increases the amount of work that the Judge has to do in a scenario which already requires her to keep track of a foe which itself is trying to keep track of the NPCs. Further, because progress is slowed across the wilderness–after all, the player characters are hauling a dead medibot with them–it becomes a slog, not just in terms of the player characters’ progress, but also for the players. Physically, Mutant Crawl Classics #5: Blessings of the Vile Brotherhood is well presented. The artwork is fun, the cover suitably weird, and the cartography good. The cartography is not quite as clear as it good be, but the artwork is effectively used to illustrate locations where the maps are not as clear as they could be. In general, Mutant Crawl Classics #5: Blessings of the Vile Brotherhood handles its mix of hunt for the player characters, small pre-written encounters, and random encounters reasonably well, but perhaps it could have included some pre-written encounters which the Judge can add to the adventure should the player characters decide to head across country. Overall, Mutant Crawl Classics #5: Blessings of the Vile Brotherhood has a solid, even fun set-up, but the Judge will need to work hard to prevent it from coming too much hard work with not a little to do for the player characters.